Slumber-Roo sells lots of beautiful baby carriers and accessories on our retail site. 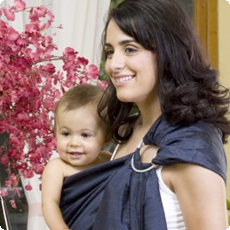 We are also the UK distributors for Beco Baby Carrier, Scootababy and Moby Wrap products. If you have bought one of these beautiful products online, you can now receive another one completely FREE by recommending our products to your local speciality baby gear retailer. Many times, there is no store nearby where you can handle and try-on a varied range of quality baby wraps and carriers, and this is where the opportunity arises. You can print off our business card using the link below, write your full name and phone number on it and drop it off at a retail location of your choice. If the store then places a minimum wholesale order for twenty units, we will send you a FREE carrier; identical brand to the order, in a colour/print of your choice. Remind the retailers to mention your name and phone number when contacting us. Make a point, that there is NO charge or additional cost to the retailer by revealing their source and infact, they'll receive a free accessory for their trouble. Additional recommendations equal - additional FREE carriers or alternatively, vouchers to use on alternative products from the Slumber-Roo retail store; details on application. People will be constantly stopping and admiring your beautiful baby carrier and our loyal customers often request cards to help spread the love. Now you can register your postcode and receive all sorts of additional benefits as a special thank you. Just fill out the Contact form to register your interest, don't forget to include your postcode, and then we'll be in touch within 7 days to confirm whether your postcode is still available - it's that easy! But be quick, as only one customer can register in each postcode area and if there is already a retailer stocking our brands in your area, then they would automatically claim the postcode. It might not feel like it yet, but Summer is just around the corner, soon it will be time to dust off your linens and show off your beautiful baby in something altogether more airy. To help you on your way to a spring babywearing wardrobe, we'll send you a 10% discount when you recommend a friend or friends (valid for the month) and in addition, enter you into a free prize draw to win a Sakura Bloom Sling package worth '250.